Kenneth Cole’s strategy, copy, and design teams did rather well with this one. With a subject line of “Get 15% off by helping Haiti”, what subscriber wouldn’t be intrigued to open this email and see how? Once inside, and after downloading images, you really get the full presentation of this email. The next thing I noticed was the textured gradient like background as well as the newspaper clipping like secondary headline, that really gave this email a printed flyer feel. Very cool. The mosaic like graphic at the bottom of the email really reminds me of an image optimized via Mozify, based on the pixelated effect, but in this instance it really gives the image a worn look. 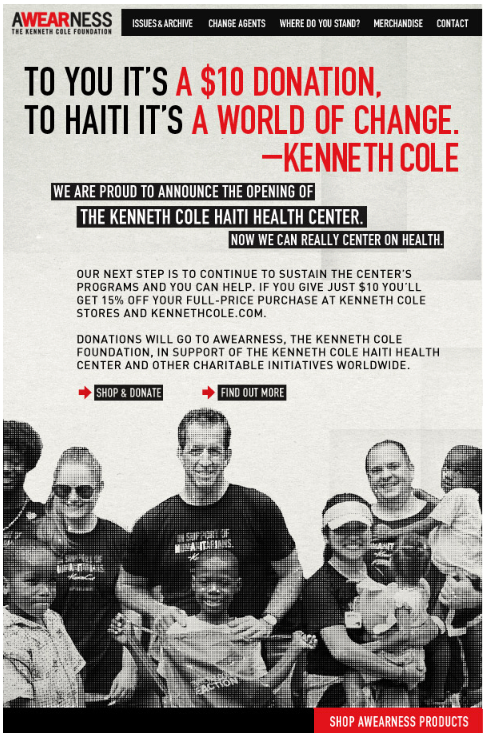 Good luck in your aspirations for your new Haiti Health Center Mr. Cole, I’m sure this email will certainly help.